Speaker of the House Nancy Pelosi has an unofficial job during tonight's State of the Union: as the sole face of the Democratic party on camera directly behind President Donald Trump, she is tasked with listening and reacting to his remarks, knowing that those who are tuning in at home can see her. But as Trump spoke, Pelosi couldn't help but to shift her gaze from the back of Trump's head to sheets of paper on the desk in front of her. Some of social media suggested she was reading ahead in Trump's speech or fact-checking his claims. Others wondered whether she might be reading over the introduction she was supposed to, but didn't get a chance to give the President. 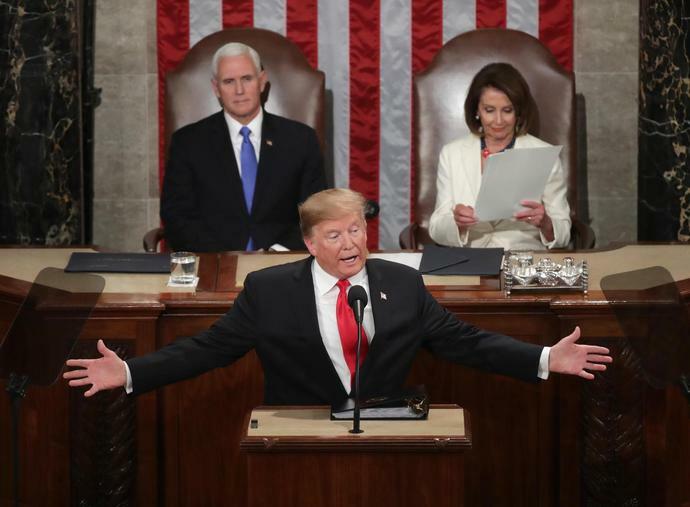 Trump's State of the Union address broke tradition by starting without the formal introduction typically offered by the Speaker of the House. Trump, also breaking traditional cordiality, failed to congratulate House Democrats on their success during the midterms, or on Nancy Pelosi's reclamation of the House gavel. Whatever is on the paper, viewers on social media are curious.